We have a school board election May 6th. I had the pleasure to moderate 5 of the 6 candidates on the Trailer Park show. House Bill 100, Senate Bills 113, 176 and 361 all deal with statewide governance of rideshare companies in the 2017 session. “We can let the public decide, why does the government need to dictate who we should get rides from and how it should be done,” Nguyen said. Nguyen says lawmakers filed a similar bill in 2015, but it didn’t pass. 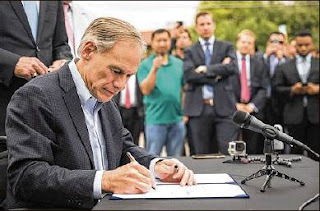 This time around, he’s more confidence because of what happened in Austin when Uber and Lyft left the city after a new fingerprint background check ordinance passed. “I feel more confident than I’ve ever felt before,” Nguyen said. A texting and driving ban has also seen similar bills in the past three legislatures. However, lawmakers hope this time around will be different. "I hope that we can find the energy to make it happen this year in Texas,” rep. Celia Israel said in November, 2016. Here is the Senate Testimony where the city of Austin of discussing the ride-share bills.